What's wrong with the world today? It seems that everything's wrong with it, but do you know why? Why is it in this world in which we live, this upset chaotic war fearing world, why is it that the churches are not proving to be the stabilizing influence that could saved this world? Why is it the churches are lacking in power? What's wrong? The thing that's wrong is that the churches have not had the true medicine to save this world. They haven't provided the stabilizing influence, they haven't had the knowledge, they haven't set the example to change this world into what it should be, and to lead this world into the way of peace and into the way of happiness and all that we ought to have. I wonder if you realize that God Almighty and the Bible hold the religious professing people and the preachers and the ministers responsible for the condition! Now where is The True Church today? Jesus Christ has said, "I will build my Church." He did build His Church. Which church is the True Church of God today? That is, The True Church that Jesus built, the church of which He is the living head. Where are you going to find that church.., among all of these hundreds of different sects and denominations or are you going to find it among any of them? They all disagree. They all claim to get what they believe out of the same text book, the Bible, which simply is another way of saying, my friends that they all claim that the Bible says something different. One says the Bible says this and another says no you're wrong. That church is wrong, it says what we think and another says, "You're both wrong, here what the Bible says." Now what does that mean? Well, it means that they are not reading the Bible like they read any other book. You hear that you can prove anything by the Bible. You hear, a lot about different interpretations of the Bible. Now.., you take some book on science, you take some book on ancient history, and do you find that this professor has his interpretation of this book on science or history or something of the kind? And then another college there's another professor that has a different interpretation of that book and over here in another is a different one. You take a text book on chemistry.., Do you find that one professor in one college says well I teach this book a certain way; this is my interpretation of this book of chemistry. Now, my interpretation of H2O is so and so, but another man thinks that H2O is something altogether different. Why, of course not. Where ever you go, H2O is just water and they all see it the same way; they don't have different interpretations. But when you come to the Bible, my friends, they don't read it like any other book. Now, do you know why? There is a reason! Everyone has to try to change the Bible and try to pretend that it doesn't say what it does but says what he wants to make it say; and that is his interpretation. That where we get interpretations. Now the Bible shouldn't be interpreted. Someone says, well Mr. Armstrong, what's your interpretation? I say, "Well, I don't have any." That's my reply. I accept the interpretation of Jesus Christ. He's the author of the Bible. He's the divine architect of the Bible and the plans and the blueprints of the life we ought to be living and that which we should be building. And we should be working according to the plans and the blue prints, you're employing contractor to build a building for you and you've employed an architect, he's drawn up the plans and you've furnished the blueprints now to the contractor and you've approved it, you're the builder, and it's just the way you want it. The architect has done a wonderful job. It's absolutely perfect, you'll approve everything he's done but the builder says well this is my interpretation of those plans. Where it says this is to go two feet this way; he interprets that to mean six feet. And another place he interprets it to mean two and one-half inches. What are you going to do with a contractor like that? You're going to fire him and you know, we're the builders that are building something and God supplied the architect, Jesus Christ, and he wrote out the plans and the blueprint of what we're suppose to build, and that's the Bible. And, we twist it around and we don't take the plans as they are; we try to twist it and change it. Well, I hope I, shouldn't say we, but some people do. What about you, are you doing it that way? Or, are you doing it some other way. Now, if you're going to look for The True Church, let me tell you, what The True Church is and where you'll find it. You have to know what to look for first. You know the trouble is, my friends, we've been assuming something. We've been assuming that the Church is the organized, political, religious body, or bodies, that will profess that they're Christians, that'll put a Christian label on the outside of the bottle or the package or whatever it may be, and we accept it and we just believe it, we swallow it absolutely, we never look inside to see whether it is genuine and whether the label is truthful or not. And so we just look at organized bodies that have the name Christian and suppose that that must be the Church. You know, the Bible said that many false prophets would go out into the world. That's what Jesus Himself foretold. And in the book of Revelation you will find and Jesus is the revelator, the real author of it, that all the nations have become drunk on the false teachings of paganism.., on the wrong spiritual teachings. And they're so drunk about it today that.., when you begin to give truth and they get a certain piece of truth, and most of you out there, my friends, you get a certain piece of truth on a certain broadcast that I bring you. It's a challenge. Perhaps it offends you at first; you look in your Bible and you say.., well that's true. What this man said is true! And what we have always been believing and supposing the Bible said is not true. But then right away you think of something else that you've been taught and you believed that contradicts that. And yea, how do you explain that? And then something else comes up and a thousand and one, errors that you have been taught, you have been inoculated with and wrong teachings come up to your mind, until you can't see the truth!! And most of you are exactly in that fix today. And it's almost a hopeless case and unless you can do what I had to do years ago when God struck me down as certainly as he did the Apostle Paul and when He was calling me into this work and I came to see that the Bible said exactly the opposite of what I had been taught in Sunday school. I had to lay everything that I had ever believed and swallowed and accepted and been inoculated with up on the shelf, so to speak.., on the figurative shelf. I laid it up there. I put it out of my mind; I said I won't trust anything that I've supposed was true. I'm going to prove everything now and not just to try to prove what the other fellow says is false; I'm going to prove whether what I believe is right or false. Well, a few of the things I laid on the shelf I was able to bring back down because everything I had been taught wasn't wrong and I hope you understand me I don't say that everything that any church or every church or any church teaches is all wrong because in this world we have a mixture of good and evil. A mixture of truth and error. And I don't know any church that doesn't have some truth. And you may, want to contradict that, you may think that you know of some church somewhere that you don't like and you think they don't have any truth, but I know most of the church denominations and most of their doctrines and everyone of them has some truth somewhere. Some have more and some have less. But I don't know any that has all truth. Now, we're all human. And we're living in a world that's very greatly mixed up. In a world that's drunk, spiritually. And it's spiritualize is so blurred that it see double and it can't see sharply and clearly. And I tell you, my friends, you can never get to the real truth unless you can undergo the process of unlearning and you have so many things that you have accepted to unlearn. How did you come to believe what you believe? Well, there are four processes but the main one and the way in which you have come to believe most of the things that you believe, is simply that you have just accepted and memorized what you've heard or what you've read. You just came to believe like other people. You want to be popular and you want to be one of the crowd; you like to conform. And we've all been conforming to this world. The Bible says be not conformed to this world but be ye transformed by the renewing of your mind. And our minds ought to be renewed. We need to sweep out and clear out the rubbish and clean house in our minds. And that goes, my friends, for most of you listening; I know. Because nearly everybody is.., in the same boat. Now The True Church is composed, if you want to find God's Church, the Church of which Jesus Christ is the head, in the first place it is not a political organization; it's a spiritual organism. And it is composed of certain individuals and they may or may not know one another. The Church is composed of those who are the begotten children of God and who are led by the Holy Spirit. And to be led of the spirit, you must not be led around by your own carnal nature. Your mind, resides up and over and above the natural human carnal nature that is in you; it's in every one of us. And you can come to see where the pulls and the impulses and the strong desires of human nature and the carnal mind are wrong. And you can reject them, and you can have the will to direct yourself in the way that you see you should go if you use your mind to see what is right and sift out the wheat from the chaff. Now The True Church then is those individuals that are begotten of God, and led by His Holy Spirit. And I mean really led by the spirit and not led by other people; they're not led by tradition, they're not led by the crowd, they're not conformed to this world, they've come out of this world and they are separate. Jesus said that His Church would be those that come out of the world. I don't mean live away from it. He said He didn't pray that they should leave or go out of the world but that they should not be of the world. And we've come out in the sense that we're no longer of it. Yet, Jesus commission His Church to go into the world and to preach the Gospel to the world but not to partake of its ways; its beliefs, its ideas. Again, I've been quoting so often lately that passage in Isaiah 55 that tells you how to find God. Everybody's been seeking God. I read of one man that started to seek God as a little bit of a child; was taken to Sunday school one time when he was just a little child; he's a very famous writer, you'd know his name if I'd mention it. He's nationally known; has been a very famous editor of a great magazine and has written on a number of religious subjects and this very famous editor, I'm not mentioning his name because I'm not sure I have all the details just exactly correct; I read his book on this subject sometimes ago and don't try to retain it exactly but approximately this was his experience that he was taken to Sunday school and he was impressed with the sanctity and with great awe of the church building in which he was and was told that it was the house of God. He's just a little child and, well if this was God's house, that meant that the house belongs to God and he says, well, now, I want to see God then, where's God? And, well, they couldn't show God to Him. And, he's just a little fellow and so he started going away from the others and he remembers now, that later they found him back behind a lot of things and he was looking into closets, he was looking everywhere trying to find God. So he said if this is God's house, God must be in it somewhere. He must be around here; he was going try to find God. Well, that was the beginning of his search for God and he kept on searching for God ever since. Now, a lot of people are trying to find God; they're searching for God. But they just want to search for God in their own way and they're own human reasoning and the God they search for, that they finally wind up with is one of their own invention by their own human mind. In other words, the God they finally produce is the God of their own creation. And they become God's creator and God is merely a figment of their imagination and is for less than they are because He's nothing but a phantom they originated. Now most of the gods that are describe to you today, and many famous people have come out with a new conception of God. They say that I have a new concept of God. I've been searching for God and at last I have found God. Oh, have you? Well, if you want to find God, I'll tell you how. You'll have to forsake your ways and you'll have to forsake your thoughts. And you'll have to return to God who ways are not your ways and whose thoughts are as high as the heavens are above the earth over your thoughts; there not like yours at all, and yours are just like other human beings and you go along with the mob and the crowd and just like sheep you want to be along with everybody else; you like to be popular, you want to be well thought of. Women want other people to think they are pretty and men want other people to think they're important. And you all go along wanting to be well thought of other people. You want the pleasures of other people and you care more about what other people think that anything else so you want to conform. You'll never find God that way. No one ever did find God until they could forsake all that sort of thing.., entirely. Now, God is the Creator, my friends, He created us, you can't create Him. Anything that you created isn't God it only something imaginary. You know, God did give us a mind something like His. Only, it isn't as all encompassing and as all powerful or as perfect as His. And, the way we've used our minds, inventing engines of destruction, and using our minds to beat the other fellow; take advantage of him and to destroy and to tear down it's a good thing God limited our power and the amount of mind power that we have, isn't it? Because man has turn his mind to wrong pursuits entirely too much. Well, The True Church are those who believe the faith once delivered. That is the message by Jesus Christ. The Faith once delivered was delivered by Jesus Christ. He taught it to His disciples. They became Apostles. They taught it to the Church and the faith once delivered is the faith that was believed by that Church during the first thirty-eight (38) years of it's existence after the resurrection of Christ. The True Church are those who have the doctrines and the teachings of Jesus. They believe what He taught. The churches today believe exactly the opposite. You can go through the New Testament as we've been doing. You can see what Jesus taught; today that teach almost diametrically the opposite. Now, when I say they teach the opposite, here and there will be a church that doesn't teach opposite on that point but will on another. I realize that. And yet, I have to mention what is more or less generally and popularly taught by various churches today. You have to see whether the shoe fits any particular church or denomination or not. I not trying to do that because my purpose isn't to say anything against any church. I not here to run churches down, that's not the purpose. Some people seem to think it is, it isn't. My purpose, my friends, is to wake you up!! And to open up your mind and to get you to see the truth and bring you into the wonderful truth of God which is the only thing that can ever make you free. And you're not free. Most of you are slaves; you're slaves to passion, you're save to sins but you don't even know what sin is. Very few preachers know what sin is. You think sin is doing what you think is wrong or what your crowd says is wrong and condemns and that's not God's definition of sin at all. God set laws in motion; those laws are living things; they are powers, they are forces, they are energies and they are in motion! They are spiritual laws and there are physical laws and sin is the transgression of the laws that God created and set in motion inexorable living powerful laws. And the whole world is violating those laws and that's why the world it bringing unhappiness on our selves. You violate one law, it'll give you a headache, you violate another law, it'll bring you heartache, you violate another law, it'll give you a stomach ache and we're just full of all kinds of aches and pains.., because we're violating laws. You know, war is nothing but the penalty of violated law. And the only one that can ever end war.., and can ever bring us peace is the one who can pay the penalty of sin and turn us away from our ways and into the righteous ways of God's law. War has come from violating the law of God. If all the nations had kept the Ten Commandments, according to the spirit of those commandments, there would never have been any war. Jesus Christ is the only one that can bring us peace. Let me tell you, God has told us what to do and it's in the prophesies. And He warn us what not to do and you'll find it in prophesies like Hosea and Amos in your Bible if you ever know how to apply it and know where the United States is mentioned in prophecy and if you understand what prophesies are intended for us and have any understanding of prophecy at all. The one thing God tells us not to do is to rely on foreign powers as allies. And to try to ally with them and that's all we ever do, we don't rely on God. We makes some empty platitude prayers to God. But we don't put our hearts in our prayers and we don't really believe that God is there listening; that He's going to answer, do we? I mean, the nation as a whole doesn't. Maybe some of us individuals; but it's going to take more than one or two individuals before God will answer and save this whole nation. Now, The True Church are those: *That are begotten of God and led of the Holy Spirit; *Those who believe the faith once delivered which is the faith of Jesus Christ that Jesus taught and that the early church did believe. *The doctrines and the teachings of Jesus and those who follow the example and the customs of Jesus as he did. Well, today, they all follow exactly opposite doctrines and customs and ways and everything of the sort. 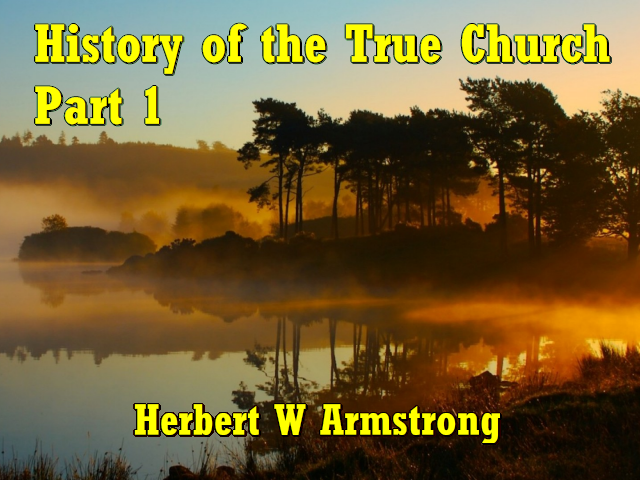 The True Church will be exactly the same as the early church under apostolic times. Now again, The True Church is composed of those who have been corrected, those who have been reproved and have been changed by the word of God. Those who have forsaken their thoughts and their ways. Those who have come out of the world in the sense they are no longer of the world even though they of course they are still in it. And those that have become un-conformed to the world; who are no longer conformed to the world but have had their minds changed by the spirit of God which is the spirit of a sound mind. And now the minute you begin to do that and the minute you believe what Jesus taught and the minute you begin to do what Jesus did, they're going to call you a fanatic. Now they called Him one, they hated Him. They sought to kill Him and they finally did. And Jesus said, if they've hated me, they'll hate you also. If they persecuted me, they will persecute you also. The servant is not greater than his Lord. The Church then.., is the church greater than it's Lord? The Churches today think.., well we're not persecuted. Jesus was! Are they greater than he? Jesus said that His church would be persecuted. Why? Because His church is composed of those that have forsaken their own ideas and the customs and the ways of the society and they're living by every word of God, they're the people who look on the Bible with respect and with awe and as the supreme authority and who recognize the authority of the word of God who look upon God as the supreme authority. What do most people do. Well, they look on their own consciousness's authority or they look on the proclamations of men or the decisions of their church board. They say, well now, our church looks at it like this and the person who says that usually had no voice in the matter. That's what the committee at the top decided the church would believe. And, all of them, you know, they're just like little children that had funnels stuck in their head. And the committee at the top of the church decides what the church is going to believe and that's their ready-made propaganda or their doctrine and they go along pouring it out of a pitcher down the funnel into the brains of these people and they say, "Now this is the way our church believes on this." And so and so is the way some other churches believes on it. Now, the real people of God, have forsaken all that sort of thing and they look on God as the supreme authority and how do you know what God says? Why the Bible is His word. And that makes the Bible the supreme authority. And it is authority over their lives and they obey it and they tremble before the word of God. Now, most people don't. You show the average man that the Bible says thus and so. Oh, well, I know, the Bible says that but.., here's the way I look at it. What are you doing, my friends, as long as you're like that you're not in The True Church. No one who looks at things like that is a member of The True Church. Now, they're the same as the early Church and that Church was persecuted, they are they that have forsaken their ideas, their ways, their thinking and that means they're forsaken the thinking of the world because the world are like so many sheep all going along in the same pattern. All trying to conform with whatever is the accepted pattern. Yes.., no originality. You know the right way to be original is to find God's way and follow it. Now when you forsake the way of society and when you follow the way of Jesus and the teaching of Jesus and the customs that He observed, as I say you're going to be called a fanatic. Now, here is what brings on the persecution. It's because this changed life and the true spirit begotten Christian.., well he just sort of convicts and condemns those who won't forsake their thoughts and who won't take this correction and reproof because the Bible is profitable to correct us and to reproof us and instruct us in righteousness and righteousness is not the way of human nature. That's a different way. And so it begins to condemn these other people that won't forsake their thoughts and their ways, that won't take any correction or reproof and what is the human carnal way of reacting to that? Well, it's to begin to persecute the person who is living the right way. Now, a person living the right way may not even try to tell anybody else about it or argue about it or even talk about it but the very life of that person accuses and condemns the other people that know they're guilty and begin to feel uncomfortable and miserable and so they got to start saying things against a person that's living as he ought. And they start to persecute. And so The True Church, my friends, is that body of individuals, whether organized or scattered, that have always been persecuted and been unpopular and Jesus called them the little flock. Now, I was showing you in the Bible where very early in their history, a great persecution arose and they were all scattered. Later, there was another Church at Jerusalem but later that was scattered again. And I read you the scriptures prophesying that the Church would be scattered. And it has been scattered. Isaiah prophesized of these days and this is what he said in the thirtieth chapter of Isaiah, beginning with the eight verse (Isa. 30: 8) — Now go write it before them in a table and note it in the book that it may be the time to come.., for ever and ever. The prophecy for the time to come.., not in his day, that this is a rebellious people, that is a rebellious against God, there not rebellious against their own consciousness's; they're not rebellious against the doctrine they say that our group or our church believes. But they're rebellious against God. Lying children! Now who are lying children? If you turn over to first John, the second chapter, and the fourth verse you'll see, He that saith, I know him, [the person that claimed to know God, the people that had the form of godliness but deny the power thereof, the people that are so sanctimonious and go to church, and all that sort of thing,] and he that saith I know Him and keepeth not his commandments, is a liar, and the truth is not in him — (1 John 2:4). Now here they are lying children. And they are people that want hear the law of the Lord. Go write it before them in a table and note it in a book that it may be way for the future in the time to come for ever that this is a rebellious people, lying children; children that will not hear the law of The ETERNAL. There you are. The people that want hear the law of The ETERNAL yet they profess to be religious and Christian. And in I John 2:4, God calls them liars. And here in Isaiah 30, verse nine God calls them lying children, "Which say to the seers, See not; and to the preachers, preach not unto us right things, speak unto us smooth things: preach deceits" — (Isaiah 30:10). There you are and that's the church today. Now you find that church recorded and all of its divisions and denomination in the seventeen chapter of Revelation; The True Church of God in the twelfth chapter of Revelation and in the next broadcast in this series we'll try to go through the description of what was to happen and the prophecy of The True Church and what was to happen to it and it may tell you where you can find it, and something about it in the twelfth chapter of the book of Revelation.